I spent a long weekend in Henley On Thames where I attended the County Show and drank Pimms in the sunshine on Saturday afternoon. On Sunday we attended the annual charity car boot sale. There was so much on offer, and by late afternoon the stall holders were selling boxes of items for £1 or in some cases 50p in an attempt not to have to take anything home. 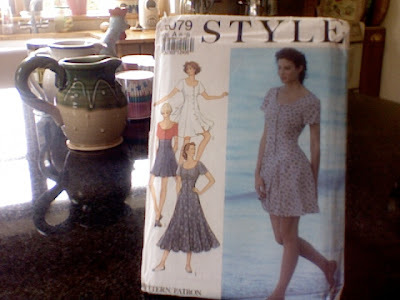 I bought knitting needles, fabric, a cake stand, an old suitcase, a blue gingham table cloth, and I found this Style pattern for 50p. 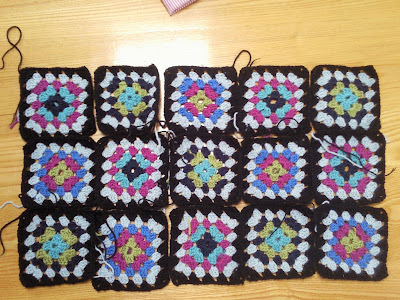 This is an update of my granny squares. Julie at Oh Well suggested that I use the black colour (she also suggested hot pink for fun, and I may try that yet) and I do think it works very well. 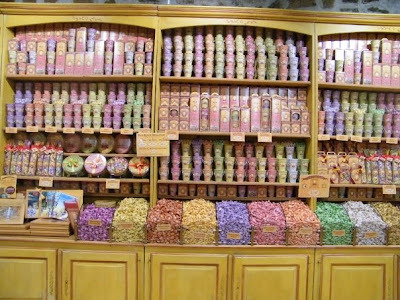 This shop, Cure Gourmande, is in Carcassonne, it specialises in biscuits (the type that melt in your mouth), chocolate covered nuts that look like olives and dragees. I love all the products, the presentation on the shelves and the way the staff package the purchases. I still have no laptop or computer and it looks like I will not have another until after Christmas. I will try to visit as many of you as I can when I can. Next week our neighbours are hosting the National Ploughing Championship, an International series of events, with thousands of people attending. There are hundreds of exhibitors with crafts, music, demonstrations, competitions over three days. I hope the weather stays dry. I hope you are enjoying Autumn, the harvest and its colours. Computers, Knitting and Long Breakfasts. I have had no laptop for the last two weeks. I took it to the repair shop and they told me it will cost the price of a new one to repair as the mother board is broken. Leiny has kindly given me the use of hers when she is home at the weekends. Sorry if I have not been to visit your blog yet , I will visit soon. The cupboard is full of unfinished knitting projects, mostly baby gifts. I try to have at least an hour each evening to do some crafting. This really translates as slow progress. Leiny is knitting a baby sweater for a certain little boy, you can sneak a peek at him sleeping over at Boladeberlin, he is so cute, and his Mammy loves sheep. Mr.Margie knew that I had been to our local Cath Kidston store and had been firm with myself about buying baby gifts and not diverting to my weakness, shoes, particularly Swedish clogs (I was wearing a pair the first time we met in Cannes, in the eighties). He came home last Sunday with them in my size, having gone to the store especially for them. I have been wearing them since. Breakfast is my favourite meal of the day, I love when it spills over near to lunchtime. The bowl is one from a set Mr. Margie's grandmother gave us, I like to use them sometimes in memory of her. This project is for a little girl born in England at the beginning of July, it is knitted in one piece using just garter stitch. I sewed on the little wooden heart buttons and added a little hat to complete the package. I am considering knitting an adult size in this (as I would definitely wear it).